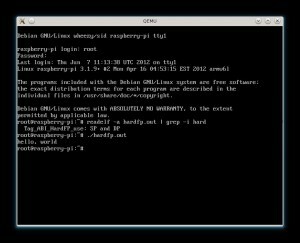 – Workaround for a kernel bug which hangs the Raspberry Pi under heavy network/disk loads. How can I run it, on Qemu? Does network work in Qemu? You will need a recent git snapshot, it doesn’t work on stable versions. What do you mean by “Workaround for a kernel bug which hangs the Raspberry Pi under heavy network/disk loads”? Is it something you patched by yourself or is it an “official” push to git? It’s just a vm.min_free_kbytes directive, otherwise the pi goes OOM and hangs even when there is plenty of memory available. You have a typo in your keyboard layout command, it should be dpkg-reconfigure console-data. Nice image BTW! Ops, sorry about the last post. Got it. Is there an apt repo setup with other packages to install? Would I be able to start an x session with this image? How can I install xfce or icewm,… When I install it in root login, than after reboot the startx won’t function. Sorry, I forgot “-l root” so gives me an acces denied. Thanks for the image ! great job! I wanted to have debian with SSH since I have no usb keyboard. Is iptables avalible in this image ?? Unfortunately not, but it is planned for the next version. Stay tuned. I’m running a small shell server mainly for IRC therefor iptables would be most useful. Thanks for Your great job. would it be possible to publish changes so that we don’t need to re-write SD image? Yes, I can add upgrade notes. Not sure where to find the person or persons who might care, but thought this might be the place to start…. Downloaded this earlier and burnt to a 2gb SDcard, very happy with the results and got my webcam working with motion. I’ve only got one question, will rpi-update work with this version or do we to wait until you update the kernel? I just tried rpi_update to fetch the latest firmware and it works like a charm. It recognizes the HardFP usage and uses the right libraries. Gigantically increased the performance of my SD card. Great image by the way, thanks!! Just started playing with this build and I have to say it is superb!!! It feels like netinst, no rubbish just a system. If U can add iptables to next version I would be best choice for RPI. It is faster and more stable. – ntp is working great. uptimed/uprecord problem fixed. – swappiness is bit high 60. I’ve just installed this with no problems, and it’s great! Just want I’m looking for as the basis for a headless server. iotop is not working in current build. Should the average Raspberry Pi user (no Low-Level coding stuff, just some Python and C and Linux ;)) use the armhf or the armel image you made previously? Don’t know the exact differences between both architectures. armhf is the faster one, there are no real disadvantages except the lack of an official Debian mirror. Hi! Any insight on how to correctly run the image under qemu? 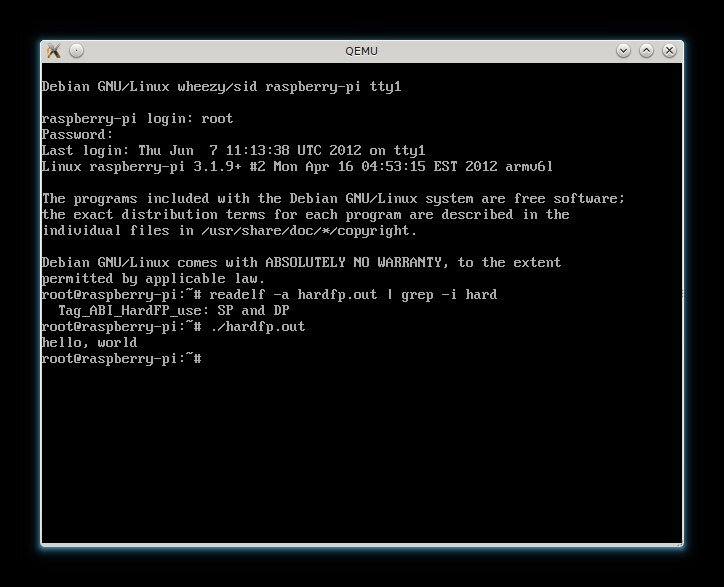 I have the latest Git verison of Qemu (running under ubuntu) and I’m using cnxsoft zImage (I followed this: http://www.raspberrypi.org/phpBB3/viewtopic.php?f=2&t=3149). Your image starts and reaches the login prompt showing a “(none) login:” (instead of “raspberry-pi login:”) and if I login as root I’m sent back to the login prompt. MAybe the problem is that I’m using a armel kernel on a armhf image? Thanks for posting this image! I’d like to compile some wireless drivers for my Raspberry Pi. How can I get the kernel source for this image? Install the build-essential package to have all the needed compilers etc. to build the drivers from source. What wireless card is it? It may have drivers on the manufacturers website, or may just need firmware to be installed from the repository. I will include the sources in the next version, if you can’t wait you find them in the official site. A very nice lightweight image. There do however seem to be some key utilities missing which I would consider essential really, such as bz2 and less. Hi, I am new to Linux and Raspberry Pi and slightly confused. I am not sure how to log into this operating system. I have tried log in as Root, password as Raspberry and then Startx but that doesn’t work. I would appreciate some help please. Will need: LAME 3.98+ , libmp3lame0 which from your package list appear to be in the repo already. Its really useless with out MP3 support and Debians version as the note below says lacks it for whatever reason, so I’ll take it based on its origins and the lack of libmp3lame0 being listed as a depends it was compiled directly from the Debian version. It make life a lot easier for MANY using Darkice to have a repo ready version with MP3 support. Look to be trying out your distro shortly for my project. the Ogg Vorbis as its Ogg Vorbis encoder. You should ask the raspbian maintainers, I don’t recompile everything. I just have one question, since I have a 16gb sd card that I use for the r-pi, how can I extend the swap partition? Since we have 256mb Ram, I figured a swap of 512 would be enough. Thanks for this. I had been trying to run a Ham Radio application WSPR which has a lot of Fortran computations and it was VERY slow under the armel Wheezy build but this runs as fast as a desktop. However I doubt I could have got it running if I had not built the armel version first. Raspberry Pi is a great education! I’m having problems getting wifi working. Do I need to recompile the source with the appropriate drivers or am I just missing something obvious? Not starting NFS kernel daemon: no support in current kernel. … (warning). Thank you for this. I originally installed the basic debian from RaspberryPi.org, and after using your image I can notice the improvements in snappiness. Pretty much everything runs smoother! Thanks again. Could you provide a hash (md5 or sha1 or something…) of your image ? 1. Any idea when your next version of the image might be out? 2. Sorry for the possibly daft question: If I use apt-get to get new packages or updates will they be compatible with this wheezy armhf image or do I need to recompile them to use armhl and get special wheezy code from somewhere else. can’t wait for this to become the defacto standard build to run! LOL, and then he read the FAQ! Thank you! It was bugging me no end that from day one there has been no ‘minimal’ image without bloated gui packages taking up precious space! With this image I can freely choose to set up a truly minimal desktop (using fluxbox for example) or have a clean headless server. This should be the ‘defacto’ image. I’m also in favor of a minimal official image, and darkbasic, I have to say, Great Job with this one! I look forward to your next with ip-tables, and just wanted to say keep up the great work, it’s my first time here, and I already know I’m subscribing to your RSS! One more thing – not all 2GB SD cards have the same capacity, they slightly vary. I won’t fit your image to mine. I could not fit it into a 2Gig card either. It had previously had a Squeezy image on it OK. I have a feeling this img isn’t built for armhf in mind. Strange. Let me know when you get a chance. I like the minimal install you are doing. Does this image have support for USB webcams, UVC, etc.? apt-get must be borked. I noticed that at first the defaults are pointed over to the archive.raspberrypi.org, i initially did apt-get update not realizing it then noticed it was downloading for armel then switched it to archive.raspbian.org and then did apt-get update and it kicked back that error. Your image is small enough Ill just reimage it and make the appropriate change to apt-get sources list. Weird i went and ref lashed it and and it looks like I must have pulled the wrong image since now it is pulling armhf debs. I notice that on raspberrypi.org there was an announcement on Thursday 12th. of an upcoming official release of raspbian. It will be interesting to see if wspr works on there. Tonight I’m trying to install wspr on the rpi_pisces_r3.img dated 10/7/2012 where hardfloat seems to work OK. I have wspr working fine on this build in the GUI version and have modified the nogui version to give a more user friendly output via SSH. Thinking hard about modifying the nogui to have a web interface so that config can be changed and perhaps watch the waterfall. The hardfloat was definitely needed. With the nogui it is possible to set it running and then leave it in headless mode. This version resolves problems downloading Torrents using Transmissions? Yes, It’s about that problem. I’ll test your version and I let know the result.